Preheat the oven to 425°F. 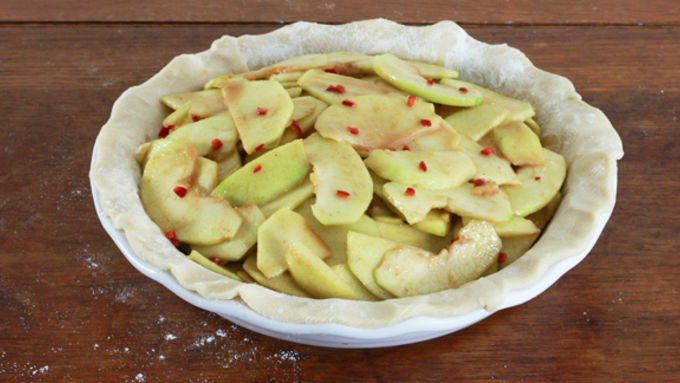 Sprinkle both sides of one of the pie crusts with flour and rub all over. 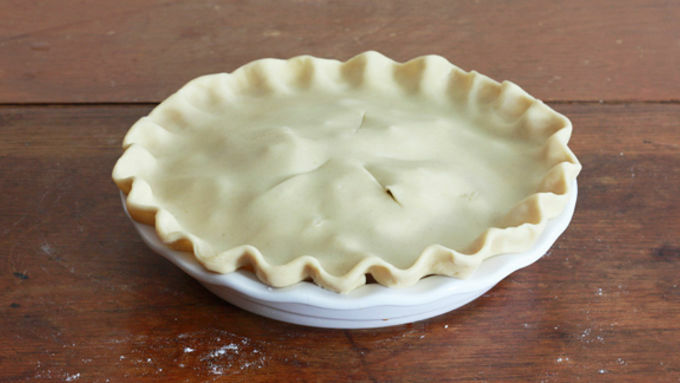 Press the pie crust into a 9 inch pie plate (glass or ceramic recommended). 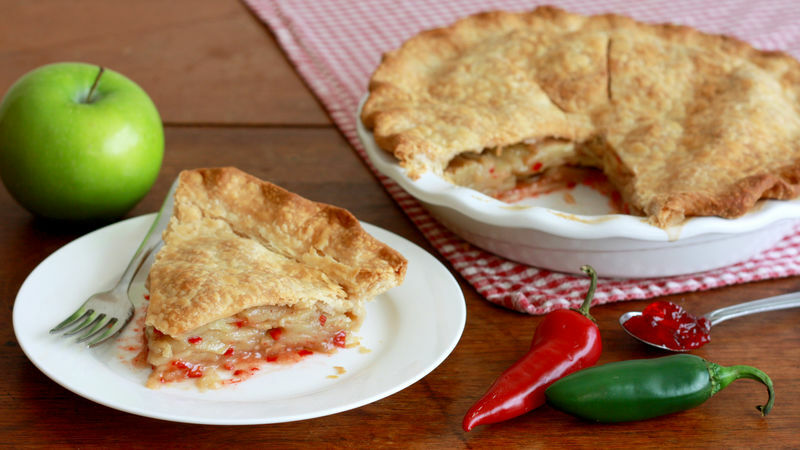 Spread the hot pepper jelly on the bottom of the pie crust. Set aside. In a large mixing bowl, add the apples, diced jalapeno pepper, white and brown sugars, flour, cinnamon, nutmeg, salt and lemon juice. Stir until thoroughly combined. Pour the apple mixture into the pie plate. Roll out the second pie crust so that it extends about 1/2 inch beyond the rim of the pie plate. Place the crust on top of the pie and tuck the edge of the top pie crust under the edge of the bottom crust and press to seal. Crimp the edges with your fingers or a fork. 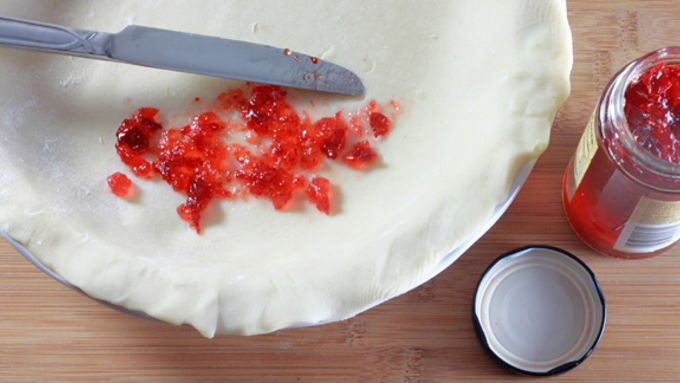 Using a sharp knife, cut five 2-inch slits into the top pie crust from the center of the pie out towards the edge of the pie to allow the steam to escape. 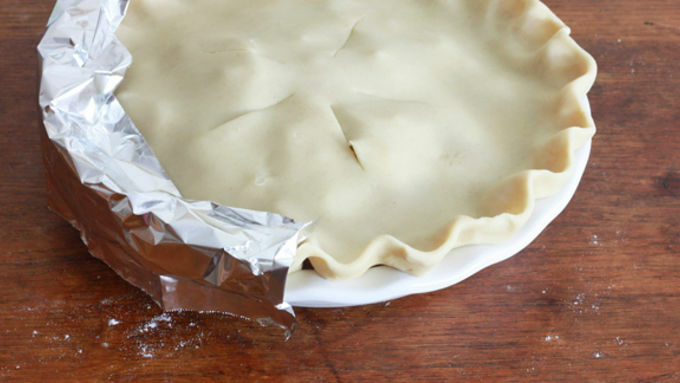 Place some aluminum foil along the edge of the pie crust to prevent burning. Bake the pie on the middle shelf for 25 minutes. Remove the foil from the edges and bake for another 10-15 minutes until the crust is golden brown. Let the pie sit for at least 2 hours before serving to allow the juices to absorb. Note: Depending on color preference, you can use either red or green jalapenos accompanied by red or green hot pepper jelly. This apple pie is a rebel. It’s “sugar and spice and everything nice” – with a bad boy attitude. Thanksgiving is just around the corner and it's time to plan the most important part of the meal. That's right – dessert! 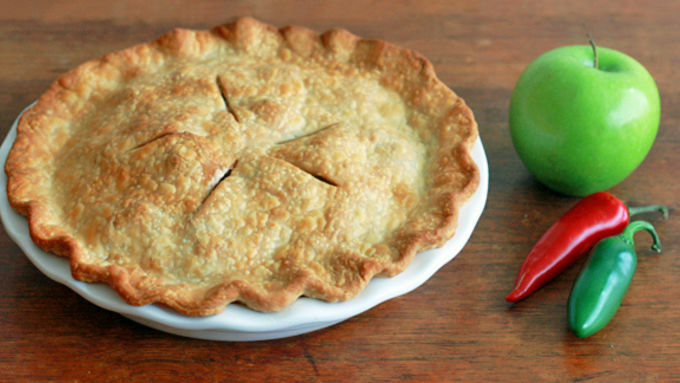 For folks looking to bring something new to the table, this jalapeno apple pie is just the thing to add a bit of sweet heat to a classic. Laced with traditional sugar and cinnamon and punctuated by spicy hot jalapeno, this is all-American apple pie with a KICK! Depending on color preference, you can use either red or green jalapenos accompanied by red or green hot pepper jelly. This is a perfect dessert to surprise your family and friends with at your holiday meal!